I have a passion for helping you achieve a higher level of wellness. Since 1985, I have practiced Chiropractic from our Asheville office on Merrimon Avenue. Using a method called Applied Kinesiology, I have successfully treated thousands of patients of all ages. Because of my unique training and experience, my patients get the quality care and attention they need to get on the right path to wellness. This is why I offer a free consultation to anyone who would like more information. I can show you a personal plan of health that is easy to manage and gets you the results your body needs as quickly as possible. I look forward to hearing from you. Schedule your free consultation with Dr. Snider today. The Snider Chiropractic Center has always been a leader and one of the best known Asheville Chiropractic offices in the use of Applied Kinesiology. Is chiropractic effective? Chiropractic works by restoring your own inborn ability to be healthy. Chiropractic helps to remove postural imbalances and structural misalignments that can accumulate in our bodies over time. I came to Snider Chiropractic because I was looking for a more holistic chiropractor, and I have appreciated that aspect of Snider Chiropractic, as well as the lower rates than my last chiropractor, the smaller office with more personalized care, and the excellence of the treatment. My pain wasn’t going away with the last practitioner, and with Snider Chiropractic, I have made steady progress on a chronic condition ever since I began going a few months ago. I am very pleased with my choice! I have been a patient of Dr Snider’s for over twenty years. Over the years I have had back, neck and hip issues. I have always had complete confidence in Dr Snider’s experience and ability to zero in on the problem whatever it might be. Whether receiving adjustments or nutritional advice I have been very pleased with the results. About the time the “economic downturn” impacted many of us I thought perhaps I could go with fewer treatments or possibly no treatments. Well, after a very serious back strain injury I was reminded how if I had maintained occasional treatments this would not have occurred or certainly not to the degree that it did. Chiropractic treatment is so important for maintaining the body’s alignment and balance. I rarely see a medical physician and I attribute this to healthy habits of my own but also the care Dr Snider has provided to me over the years. Many thanks to Dr. Snider, his wife Peggy, and his welcoming staff. Steve Snider and staff are knowledgeable, friendly and organized. I have been receiving Chiropractic care from Dr. Snider for the past 4 years. I have sent my children, grandchildren and husband to him. That says it all. Once again, Dr. Snider has come to my rescue! He is the BEST chiropractor I have ever had, bar none! I have been to multiple chiropractors in multiple states over the last couple of decades and after moving to Asheville, I believe I have found the BEST chiropractor ever! Not only does he come to my rescue every time I go in for a visit, but he has come in on a Saturday twice already since I began seeing him a couple of months ago to help me when I am in dire need and can’t wait until Monday. Dr. Snider is professional, kind, efficient and effective, and so are his staff members! I am so glad I found him and he will forever be my go to doctor, not only for chiropractic adjustments, but for general wellness as well. Are you looking for a knowledgeable chiropractor (Asheville, NC) who can help manage a wide variety of chronic conditions? Then, check out Dr. Snider at www.sniderchirocenter.com. He helped me when no one else had any answers. Here’s my story. I was only 22 years old when I started having a massive onslaught of chronic conditions. I had GI issues, chronic fatigue, insomnia, and allergies. Every doctor I went to either told me they could not help me or they couldn’t find anything wrong. That’s when I found Dr. Snider, who turned out to be a life saver. Dr. Snider helped me understand what was going on in my body. He also gave me the treatments and supplements needed to correct my stomach problems and return my energy. Now, I can manage each day better than before. Dr. Snider, thank you for giving me my life back! Dr. Snider works magic. I know it sounds corny, but the guy worked wonders on both me and my wife. We have historically been skeptical of chiropractors. We’ve been to a few with no appreciable results. I had been hearing praise of Dr. Snider for a few years from family members. When we came to Asheville to visit we thought “What the heck, let’s give him a try.” The results have been nothing short of remarkable. His chiropractic skills are top rate but combine them with his Applied Kinesiology expertise and you really could walk away feeling like you experienced something magical. His technical skills are surpassed by only one thing – compassion. Dr. Snider really wants you to get better. Let me tell you first that I am a healthy, active 20 year old student. I see Dr. Snider regularly not because there is something wrong with me but because I can never stop benefiting from his practices! I started seeing Dr. Snider for my jaw pain after the dentists told me the only thing I could do was buy a $500 mouth guard (??). Who knew Dr. Snider could fix everything else too. Since I started seeing him, I have not had a single headache. This is a tremendous improvement from having 2 to 3 sinus or migraines a week. I also go to Dr. Snider for all my natural supplements; when I told my doctors I was feeling depressed they prescribed me an antidepressant which basically made me feel like I was on speed. Dr. Snider provided me with a 100% natural high-quality adrenaline-boosting formula that worked safely and effectively with my body. For those of you who have ever done an hour-and-a-half of yoga can compare the before and after feeling with that of a chiropractic session. The combination of both practices is heavenly. I highly recommend Dr. Snider to anyone with a spine. I’ve been going to Snider Chiropractic for a couple years now. Somehow he always manages to alleviate my pain and get me functioning again. I’m glad I have someone I can trust to go to when my back or neck is giving me trouble. He’s even seen me after hours when needed, which is amazing. Dr. Snider and his staff were a tremendous help to me during my first pregnancy when I was experiencing a lot of joint pain. I went to him before, during, and after the pregnancy and am convinced that his care contributed to my easy and natural delivery. He understands how a body can change during pregnancy and what areas need greater care. I would highly recommend chiropractic care with Dr. Snider for any pregnant woman, even if pain isn’t an issue. My wife and I both go to Dr. Snider for treatment. We both would highly recommend Dr. Snider for all your chiropractic needs. He has been #1 in our book of chiropractors. He has always helped my wife and I with any issues we’ve had. He knows what he’s doing and he’s good at it. The staff is wonderful. They work with me on my appointments and never complain when I have to cancel. They just make me another appointment. Everyone there is polite, professional and very personal. We also take our 10 year old daughter to him. She loves him as well. Our family will not go to another chiropractor as long as Dr. Snider is in business. In October 2010, my car was rear-ended by a distracted driver on Blue Ridge Parkway. The accident totaled both my car and the other driver’s, but thankfully no one was seriously injured. In the weeks following the accident, I suffered from a numbing tingling feeling in my middle back and prevalent pain in my neck and shoulders. I knew that I needed to do something to prevent any long-term damage to my body. An acupuncturist I had seen to help alleviate the pain in my neck recommended that I give Dr. Snider a call, and I’m so glad she did! Since beginning my treatments with Dr. Snider in December, my condition has improved immensely. I no longer have the persistent pain in my back and neck, and the numbing sensation has all but subsided. I actually feel better than I did before the accident! Dr. Snider and his staff are professional, knowledgeable and friendly, and I would highly recommend his office to anyone seeking superior chiropractic care. Earlier this year old back pain issues caught up with me and sent me looking for a chiropractor. 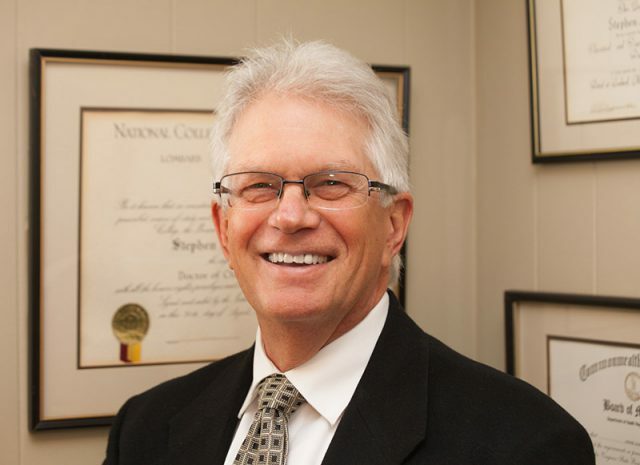 I chose Dr. Stephen Snider because I was interested in a holistic approach and was familiar with Applied Kinesiology. Along with my back issues I hoped to get relief from old G.I. issues. After a recent adjustment, as I left the office and walked to my car I noticed that my discomfort was completely gone. It felt as if a physical burden had been lifted. This summer when my 9 year old granddaughter visited she also became his patient. Dr. Snider addressed and corrected sinus and G.I. issues. Her improvements were physically noticeable. My choice to use Dr. Snider has been well rewarded. I have found him to be gentle, caring and effective. He works and speaks from the heart. Dr. Snider has practiced chiropractic since 1983. Applied Kinesiology allows him to treat common chiropractic conditions along with many nutritional needs of his patients. Applied kinesiology is an advanced technique used to diagnose and treat health problems by identifying weakened muscles. It should not be confused with conventional kinesiology (from the Greek word kinesis, meaning movement), which is the scientific study of mechanics and anatomy in relation to human movement. Using an advanced diagnostic procedure called manual muscle testing, the AK practitioner can determine the internal source of muscle weakness and then plan a program designed to ultimately restore health. Once a diagnosis is reached, the treatment may include a variety of alternative, as well as conventional remedies–from chiropractic adjustments to basic dietary changes. During a course of treatment, the patient will undergo periodic muscle re-testing as a measurement tool to verify overall improvement. Muscle testing is completely painless. Because Applied Kinesiology is such an advancement over most chiropractic care, the use of it enables our office to help many conditions that Chiropractic alone may not help. This includes the most neck and back pain that many people seek care for, but also includes care for many other conditions we treat. AK can help to improve gait, posture, and range of motion. It can also help restore normal function to the nervous, endocrine, immune, and digestive systems, and determine previously unsuspected foodr chemical sensitivities. The goal of applied kinesiology treatment is to intervene early enough to prevent or delay illness. Learn more about how Applied Kinesiology and Chiropractic can help you.